Widely used anti-malaria drugs may have an unwanted side-effect - decreasing the power of many antibiotics. Remote South American rainforest villagers were found to carry bacteria resistant to antibiotics which had never been used there. 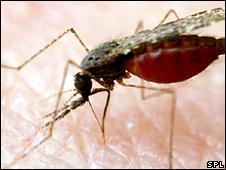 Canadian scientists believe the malaria drug chloroquine - chemically similar to the antibiotics - may have caused the problem. The study was published in the Public Library of Science journal. Antibiotic resistance is a major problem in Western countries, where strains of disease-causing bacteria such as Staphylococcus have adapted to beat some of the most commonly-used drugs. However, for a resistant strain to develop, bacteria usually need to be exposed to the drug involved, or a drug similar to it. The researchers from the Lakeridge Health Centre in Oshawa, Ontario, travelled to the remote rainforest regions of Guyana, in the north of the South American continent. They took rectal swabs from more than 500 villagers, and checked the bacteria found, including E.coli and Salmonella, for their resistance to ciprofloxacin, one of the most commonly used antibiotics in the world. They found more than 5% of the swabs had ciprofloxacin-resistant E.coli, which compares to the 4% found in US intensive care units where the drug is used intensively. The degree of resistance found was so high that it was likely that other antibiotics in the same "family" as ciprofloxacin would also have been affected. Although antibiotics had not been used in these areas, anti-malarial drugs, particularly chloroquine, had been. Ciprofloxacin is from a family of antibiotics called fluoroquinolones, which are chemically related to chloroquine. The theory of the Canadian team was that exposure to this, although effective at destroying the malaria parasite, created resistance in gut bacteria not only to chloroquine, but to the fluoroquinolones as well. A widespread malaria outbreak a year before the tests meant that a high proportion of the villagers said they had been given the drug in the preceding two years. Further evidence for the link was found in the laboratory back in Canada, where E.coli exposed to the drug became resistant to ciprofloxacin and similar antibiotics, and from Guyanese public health records, which revealed an upsurge in bacterial infections resistant to these antibiotics in the months following a major malaria outbreak in 2002. Dr Michael Silverman, who led the study, said: "This means that chloroquine use for malaria may make the fluoroquinolones less effective for many common tropical diseases such as typhoid fever, diarrhoeal illnesses, and possibly also tuberculosis and pneumonia in the developing world. "Together, these data suggest that we must focus our efforts on prevention of malaria using mosquito-control measures such as bednets and by developing vaccines. "For the short term, however, we still will have no choice but to use these lifesaving antimalarial drugs." Professor Laura Piddock, a researcher into antibiotic resistance at Birmingham University, said that the paper was "intriguing", but did not yet prove that the presence of the resistant strains was caused directly by the antimalarial drug. She said: "These antimalarials have been co-administered with antibiotics for many, many years, and I would have expected that something like this would have been seen before."